The Internet of Things (IoT) space is heating up with numerous players entering the market more and more frequently. It’s estimated that this will be a $300 billion market by 2020 and is probably enticing enough to get everyone interested in entering the market. But how does one get involved? With applications and devices centered around everything from retail, infrastructure, and transport to clinical health, medical devices, and biometric technology, and also to home automation, entertainment, and of course, wearables, the common thought is that soon everything we touch and look at will be connected to the Internet in some way. With so much competition around, companies and developers are probably anxious to get their products out in the market, but how can these things be truly tested and vetted before being made public? After all, first impressions are important and one miscalculation or delay could cause irreparable damage to a company’s reputation and sales revenue. Broadcom wants to help developers out…and at the same time earn some goodwill. 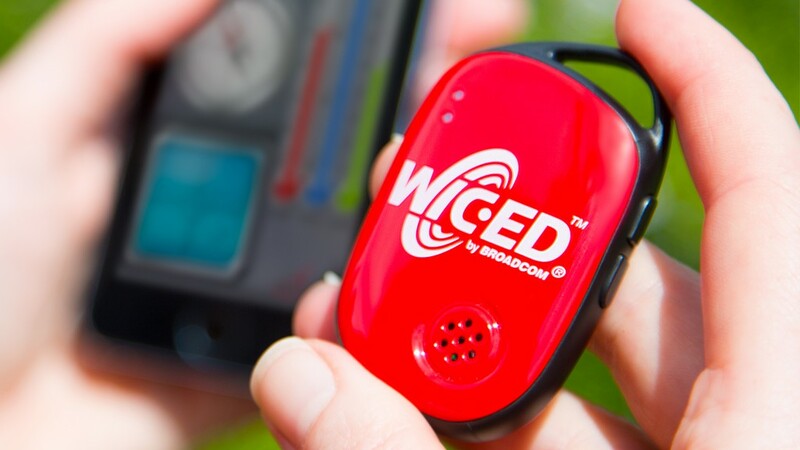 The wireless and broadband communication company has launched a new development kit called WICED Sense, a Bluetooth-enabled smart sensor tag that can be affixed on any object to aid in rapid prototyping for apps in the IoT space. The company bills WICED (or Wireless Internet Connectivity for Embedded Devices) Sense as being a “cost-effective platform” that will reduce the amount of time needed to set up and enable demos of IoT concepts for hardware and software developers. It hopes that by solving this problem, product managers will be able to usher their creations into the market at a faster pace. 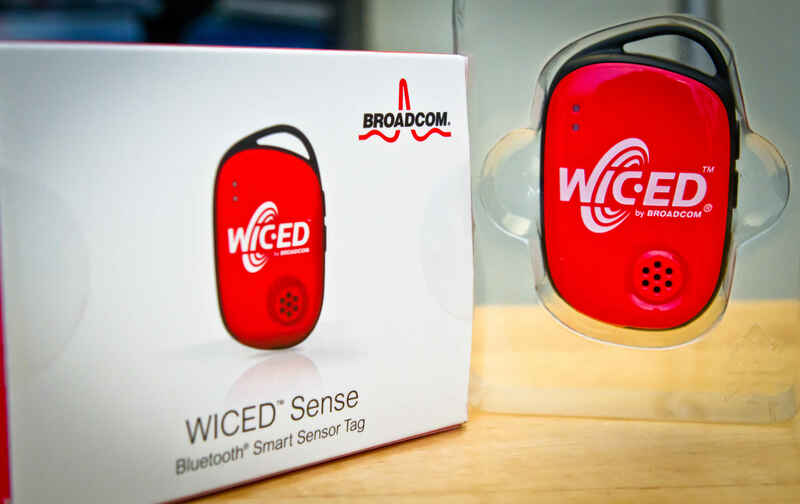 Broadcom’s WICED Sense kit includes not only the sensor tag, but also five micro electro-mechanical systems (MEMS), and has a Bluetooth 4.1-compatible software stack. It’ll work across all platforms, including iOS, Android, Windows, and PC apps. One of the main problems that Broadcom is trying to solve is that there’s no standardization for how apps are built and tested — there are different efforts underway, whether it’s with Android Wear, Google Fit, Android Auto, Apple CarPlay, HealthKit, or HomeKit, it’s a fragmented ecosystem. Certainly the IoT space is like the Wild Wild West, with hungry entrepreneurs and corporations looking to strike oil or gold. In its testing period, Broadcom has seen WICED Sense being used on baby monitors, being attached to car keys and notifying smartphones to help locate them, create a security device for pets by attaching the tag to their collar and signaling a smartphone when the pet wanders off the property, and more. Look, the Internet of Things space is ripe for further innovation and if you want to create a smart toaster that will tweet when your toast is ready, then that’s great. Regardless of your intentions, the bottom line here is that WICED Sense is the fast and easy way to quickly test to make sure your concept has legs and can be executed. The advantage is here with Broadcom: it’s giving you a cheap option to test your idea and if it works, it’ll have hopefully created such a pleasant experience that you might be so inclined to use its sensors and computer chips. The company wants to dominate the IoT space and it finds itself in the right position, given its experience with security, privacy, and more. But developers have a tough choice with vendors — Broadcom faces competition from the likes of Intel as well, so this Sense kit is a useful way to differentiate itself from all other companies. For wearables and the internet of things, the core technology is connectivity, because these are devices that enable connectivity for other things. We believe the right way to approach this market is around the core of connectivity, and we add to that integrated processors, integrated power management, memory, all those things. Sensor hub integration. We create a single device, which we call our WICED family, that has either Bluetooth or Wi-Fi or NFC or some combination of those. The real effort here is to find a way to establish standards around developing apps for the IoT space — it just doesn’t exist right now. Broadcom believes that it has a chance and wants to be the leader in this effort. WICED Sense might be just what it needs. WICED Sense can be purchased from any of Broadcom’s distribution partners for $19.99. There’s a complementary application that can be used and is available only for iOS devices now.